Anyone who has spent any time watching TLC or the Discovery Channel knows that there is a wild and wacky world of abandoned storage units out there. People put their belongings in storage facilities and either completely forget about them, can’t afford to pay the lease anymore, or simply cease to care and the units go up for auction to the highest bidder. Upon opening them, strange things are frequently found. 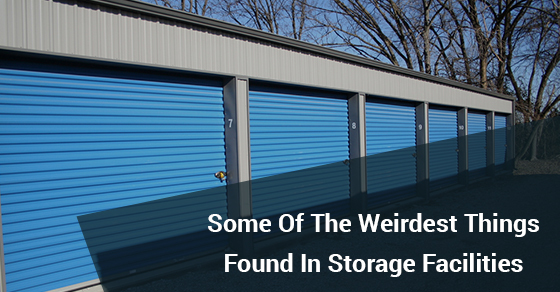 Below are five weird things that have been found in storage units. In 1989, a Long Island man paid less than $100 to purchase the contents of an abandoned storage locker. Upon opening it, he discovered a slightly damaged, wheel-less submarine car. While driving home, he was informed by other drivers on the road via CB radio that the strange vehicle he had on the back of his truck was one of the original promotional vehicles used in the The Spy Who Loved Me. The car was subsequently purchased at auction by Elon Musk for almost a million dollars. In 2007, Shannon Whisnant was shocked to find that, inside of the meat smoker he found in a locker he had purchased, lay a mummified human leg. The story gets even stranger. Shannon found out that the leg actually belonged to a man who had lost his leg after a plane crash in 2004 and, falling behind on his rental fees, was forced to abandon the unit with his leg still inside. There are typically strict rules about keeping dangerous items inside a storage unit, especially if they are flammable or explosive in nature. In 2011, Auction Hunters stars Allan Haft and Clinton Jones purchased a unit in Miami, Florida that contained a NASA rocket and countdown clock. Oddly enough, NASA didn’t even want their rocket back. In 2012, a family in Florida found out that their grandmother’s remains were being kept in a family storage unit, after a deathbed confession from their mother revealed that she had been unable to afford to pay for a burial, and instead opted to keep their grandmother’s dead body in a storage facility. Storage facilities often reveal the stranger side of human nature. They are safe, secure and private, so many people feel comfortable keeping any and everything inside of them, certain that no one will ever find out. But hard times can strike and not being able to pay the rental fees might mean that your storage locker becomes someone else’s, with whatever deep, dark secrets are lurking inside.